Today I used my 380 Phantom raceboard and a 8.3 cambered sail. The windsurf conditions turned out to be good at IJburg. There was an increasingly Northeasterly wind. I was not alone, there were at least 20 others on the water (and some onshore). Waves where moderate (something like 0,7~1,2 m). First I did some crosswind reaches, later I thought lets go a bit towards Pampus. I was halfway faster than expected (soo, I thought why not go all the way). On this first reach I used the daggerboard and a 3/4 front position of the masttrack. Now I analysed the "upwind speed" (speed against wind) was on the long run approx 5 km/hour. 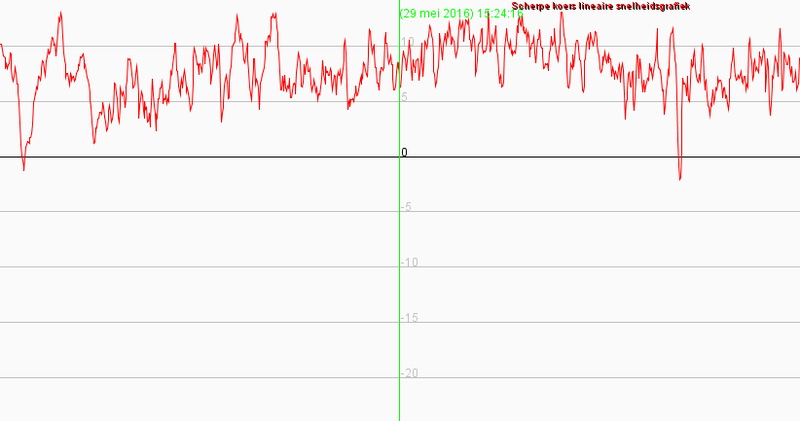 While the short reaches near Pampus turned out to be nearly average 10 km/hour, I remember to push harder near Pampus, this was because I just didn't make it. It turns out to be that pushing as tight as possible was faster (compared to balancing upwind). After I returned from Pampus I was tired. Using a daggerboard for a long distance in moderate chop/waves took my energy. Before I did a second run I changed my downhaul (a bit more) and I changed the fin. Now I used the Sonntag SL-S 450 instead of the standard Drake. The second run was with more wind (17kn instead of 15kn). And it turns out upwind gliding wasn't much slower compared to pushing upwind with daggerboard, however the speed falls down rapidly when the wind decreases. Also the Sonntag Fin SL-S boosted the downwind speed significant, this is a surprise because with the Sonntag I didn't feel powered up and with the Drake I hardly felt very powered up (guess thats drag). But best lesson was, gliding was definitely less exhausting compared to going upwind with daggerboard. I will test it a few more times, but I think to prefer gliding (if the wind is allows).